Mom said she had no Monday mischief to blog about so Bruin thought he'd help her out. By rolling around in poop, which wasn't any of ours. Five minutes before mom had to leave for work. Now he stinks to high heaven and Maggie and I have to smell him until mom gets home! Thanks to Bruin's bright idea, we are joining the Monday Mischief Blog Hop, hosted by Alfie's Blog, My Brown Newfies & Snoopy's Dog Blog for hosting. Oh dear, not the best of mischiefs to do, have you made Bruin stand in the corner on his own ? Eau du Poop! Oh dear...that is probably some STINK! 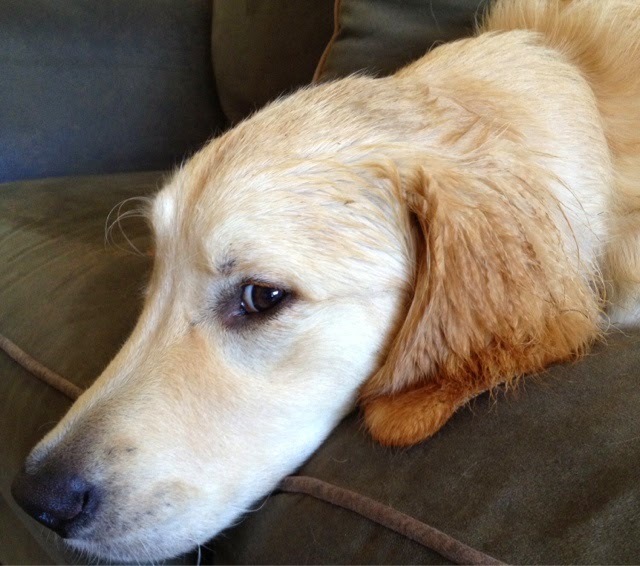 Dog poop and dead animals--these are a few of dogs' favorite things to roll in. Oh Bruin...what a way to start the day! Now that is some mischief and poor mum will have to deal with it when she gets home. Have a marvellous Monday. Bruin that probably wasn't the best choice little guy! The minute I saw that word "rolling," I thought OH-OH! Stinky Bruin! What is it that's so appealing about poop? It's like poop and dead animals are the best smelling things in the world to dogs; and we all know how good their noses are. Now you've got to deal with it after work, such a Monday. Is there ever a handy time for poop rolling BOL?? Poop is the best perfume in the universe. They always pick the best times don't they? Mr. N did that before we were due to go for his therapy orientation! Bwahaahaa! Well done, Bruin! What a legend! We usually end up gettng hosed or something terrible when we do that at the wrong time. Tell mom to keep a mixture of one part golden Listerine and three parts water in a spray bottle along with the old towels. Then she can spray and spot clean Bruin and help get rid of the smell. And yes, it always seems to happen at the very worst time. Wow Bruin, you have this mischief thing down to a science!! Good going!!! Your blog... it's soooo clean! Hey Bruin... Now, it's your turn to be the receiver of mischief. Get the shower and shampoo! Sometimes I think they come up with ways to keep us at home.